Apparently all the weirdos come out in highsec at this time of year. As a consequence, we have an extra-long edition of Kills of the Week for you. The following are some of the finest of the New Order's contributions to the peace during the week of October 27th @ 00:00 EVEtime through November 2nd @ 23:59 EVEtime. Enjoy! If Arden's valuation of the Estamel mod is correct, this is surely among the priciest losses ever suffered by a bot-aspirant. 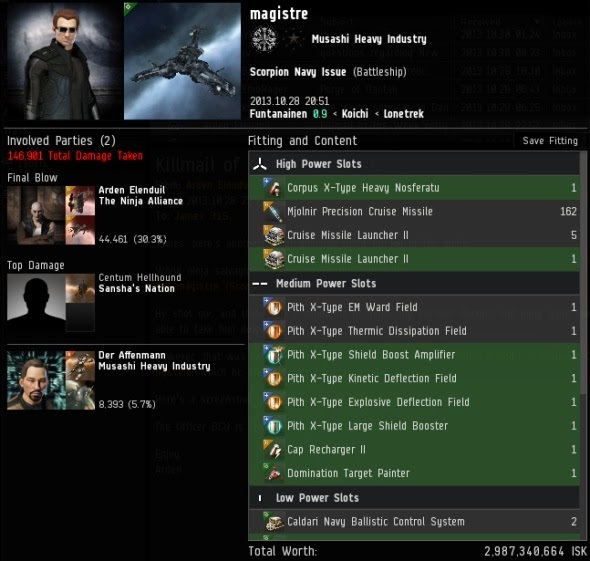 ...Incredibly, magistre lost over 11 billion isk when his Scorpion Navy Issue was killed two months earlier. 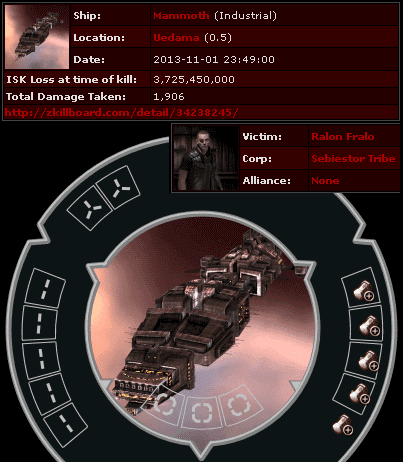 And that was also a result of an awox! I'm glad to see people holding their fellow corp members to account. Ralon Fralo had some cargo he needed to move through the Uedama system, so naturally he put it into an anti-tanked tech I industrial ship. Guess who was there to greet him? Agent D400, of course. The cargo contained many expensive items, including a PLEX and a Genolution 'Auroral' AU-79. It also contained a surprisingly large collection of clothes. 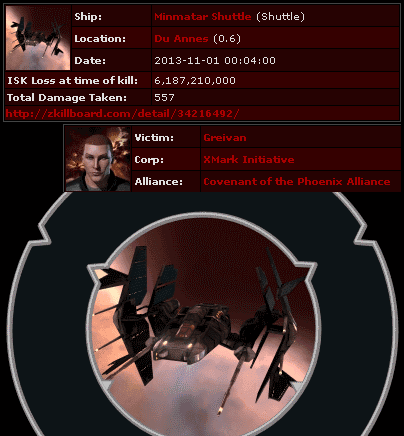 All told, the cargo was valued by Eve-Kill.net at 3.7 billion isk. Zkillboard estimates 5.6 billion was lost in the attack. 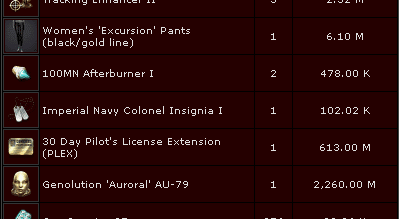 A word to the wise: Next time you're out shopping for space-pants, save 10 million isk for a permit, OK? Knights of the Order conducted another fish fry* last week. 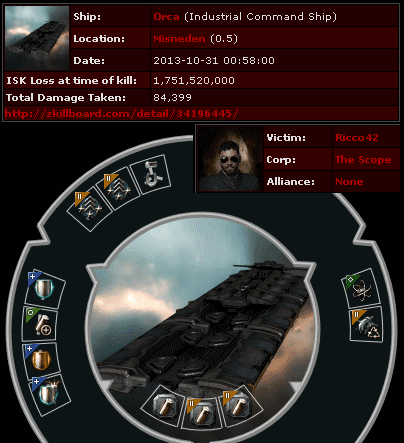 The best of the Orca kills was Ricco42's 1.7 billion isk abomination. Agents loyalanon, xxBLACK SKULLxx 929, Capt Starfox, John XIII, Dr Wiwwy, D400, Agent 057, Crazy Bill Ovaert, Kristos Valamache, PanzarPanda, Maestro Ulv, Biodegradable, Minsebstor, McCope McCopenhagen, Rayner Aldent popped him, along with his 600m pod. * As I've pointed out before, Orcas in EVE, unlike orcas in real life, do not breathe air, have hair, produce milk, etc. Therefore, they must be classified as fish. 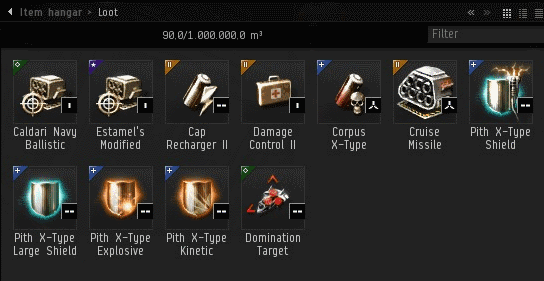 ...1.1 billion isk worth of implants in a "gold pod". Our heroes patiently waited to ensure that all five of them got on the killmail. Murdock, you can paint the outside of your pod whatever color you like, but it's what's on the inside that matters to me. As far as I'm concerned, you're rotten to the core. 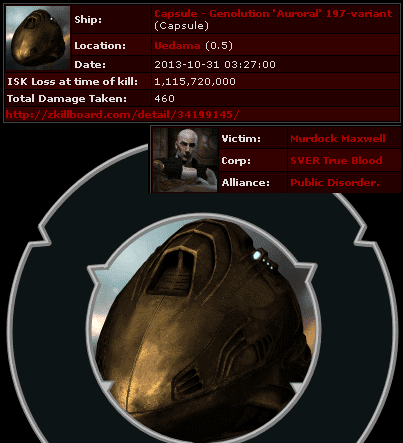 Send me some isk and we'll talk it over. You might think Giovani De'yonet was acting a little foolish when he fit his Cheetah this way and auto-piloted in the presence of Agent D400. Actually, that was only the second-worst decision he made that day. 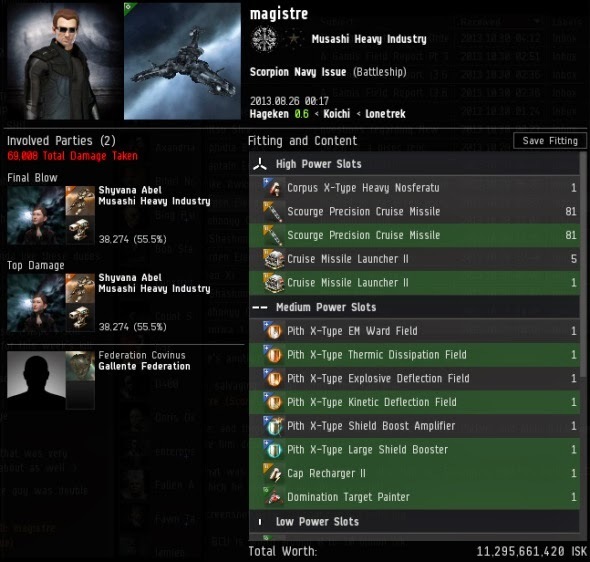 His biggest error was to put 8 Republic Fleet 1400mm Howitzer Artillery, totaling over half a billion isk, in his cargo. All of them dropped. 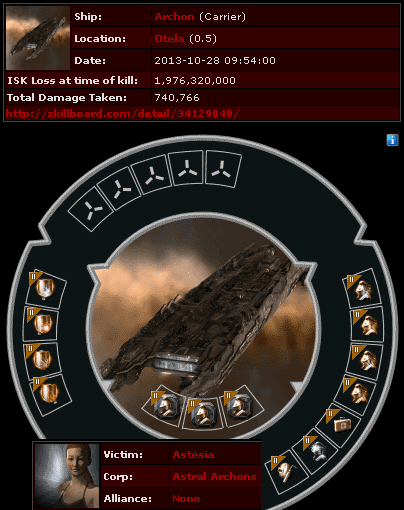 Zkillboard values the pod at 3.6 billion isk. 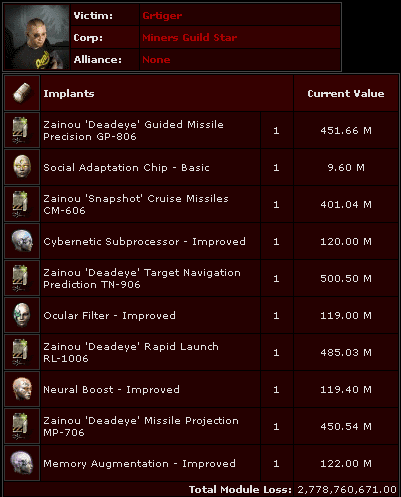 Regardless of the isk value, every good citizen of highsec knows that an implant is worthless if it gets popped. You see, Astesia has long had an ambition to run a giant highsec mining fleet in Otela. At first, things were going well, and miners flocked to her fleet. When ice asteroids were infinite, it made sense for miners to all hang out in one well-protected ice field. But then the New Order came and took it all away. Thanks to our propaganda campaign against infinite highsec ice (and I use the word "propaganda" in its best sense), CCP finally realized that it was bot fuel. So they made ice finite. It no longer made sense for miners to group together (in fact, it's best to spread out, so other miners don't mine the ice out from under you). As the miners scattered, Astesia's dreams were shattered. Thus, Astesia sought gratification elsewhere. (Attempts to find gratification outside of the Code are always futile pursuits.) 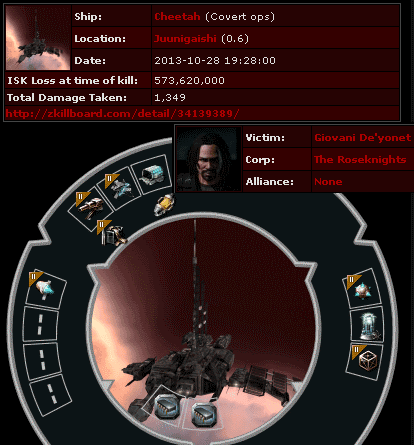 Astesia acquired one of the few highsec carriers in existence, an Archon. And started mining with it. There are conflicting reports about what happened behind the scenes with the petition(s), but what is known is that CCP told Astesia that they would be moving the carrier to lowsec, where it belonged. So Astesia went nuts and deliberately had the Archon go suspect, and invited random locals to destroy it. This TheMittani.com article explains more. 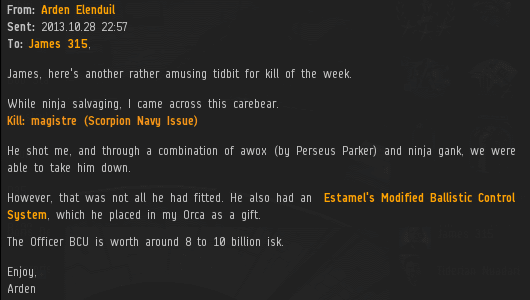 Long story short, Astesia felt entitled to have a carrier in highsec, and preferred to see it die rather than go to lowsec. Disgusting. Greivan met Agent D400 under very unfortunate circumstances. 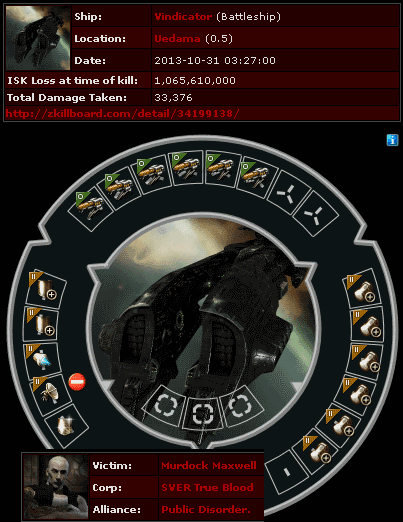 He was auto-piloting in a Minmatar Shuttle worth over 6 billion isk. Greivan, tell me you didn't do what I think you did. Apparently a "155" is a 155mm artillery projectile. Or something else, I don't know. Greivan may put his faith in 155's, but the best of us put our faith in 315's. Just something for Greivan to think about for the next 10 months, while he's grievin' the loss of his ten RMT'ed PLEX. Don't carebears learn that you just DON'T run around space with PLEX in your cargo....especially on autopilot....in a freakin shuttle. I like to think Greivan is one of the people who bought PLEX from Poetic Stanziel's RMT ebay cash out. it should have a cape and some spandex on. Someone needs to have http://www.youtube.com/watch?v=C2fyO4uKkxo at 2:28 put on repeat. Also a 155 is pretty small. There are small 200s even. According to the Mittens article the Capital is back in its hisec home. A few points of correction about Astecus and his mining fleet. (Astesia is one of his many alts.) First, the ice change has dispersed the fleet, no doubt, but it is still going strong. It has spread from Otela to Osmon and beyond. There is at least some boost to be found in any ice belt in The Forge. All you solo miners, it's a fine place to be. The ice change has vastly improved the quality of the average ice miner. Now there are fewer bots and bot aspirants, because you cannot sit in literally the same spot day after day, hour after hour. Ice now pays better than other mining (at least when it exists), so all the miners do it, not just AFKers. About the Archon: the tale I heard was that it was sanctioned for having a drone control unit on it. But in case, whatever the supposed reason was, it was bogus. So bogus that it was clear to CCP that the GM had made a mistake. 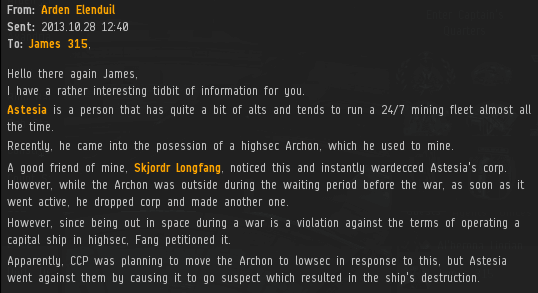 The Archon has been recreated for Astecus in Otela and CCP is reviewing their rules for highsec capitals. I am afraid that the NO has little sway in Otela. There was NO guy trying to gank there the other day, but it is quite rare. Astecus, when he is online (which is a considerable amount of time), white knights effectively in a Griffin. "As I've pointed out before, Orcas in EVE, unlike orcas in real life, do not breathe air, have hair, produce milk, etc. Therefore, they must be classified as fish." You know what else doesn't have hair, breathe air, or produce milk? Turds. And Rebel Miners. Left having experienced my first dose of James 315 tears.